The 1940 Census was released to the public on April 2, 2012. Nine out of every ten Americans has a relative in the census. First enjoy a brief history of the U.S. census and learn of the differences in the 1790-1840, 1850-1870, and 1880-1930 census records. Then, learn about the social history - what was going on at the time of this census, and get an in-depth look into the information you can find. Finally, learn what to do if you cannot locate your ancestor in the indexes. If you are an annual or monthly webinar subscriber, this webinar's recording is now available in the Webinar Library. Just head over to the library, login, and enjoy! Two pages of supplemental syllabus materials also accompany this webinar. For more information, or to subscribe, click here. Michael Brophy is a nationally known, professional genealogical researcher, heir search specialist, and lecturer from the Boston area. He has served as Program Director and Publicity Director for the Massachusetts Genealogical Council. He was the first Treasurer of the New England Association of Professional Genealogists. Mike earned an MBA degree from Suffolk University and a BBA from the University of Massachusetts at Amherst. Mike was featured on the Irish TV series Dead Money, a genealogy TV show about heir searchers. In 2010, Mr. Brophy was hired to conduct research for the NBC television program Who Do You Think You Are?, on an episode dedicated to the family history of actress Gwyneth Paltrow. He has lectured on a wide variety of genealogy subjects at the National Genealogy Society’s Annual Conference in 2014, 2012 and 2011. He specializes in New England and Irish genealogy subjects. His genealogy education includes seven certificates from the Institute of Genealogy and Historic Research (IGHR) and certificates in Private Investigation and Advanced Forensic Genealogy from Boston University. Click here for all of Michael's webinars. As a person with ADD, who is "organizationally - challenged" SOOOOO many wonderful ideas!! I even stopped mid-webinar to call a friend to tell her how wonderful this webinar is for EVERYone -- not just Legacy users!! FANTASTIC tips !!! Cannot wait to start implementing !!! So motivating !!! THANKS !!!! Lots of good information. A different way to look at genealogy altogether. :) And her enthusiasm is infectious!! I am really glad I didn't miss this one. My mind is swimming with ideas for projects! Am thinking how some special projects could enhance expressing what I've uncovered in my research. What fun! Thanks for a great webinar, looking forward to the next time Tessa is here. If you could not make it to the live event or just want to watch it again, the 1 hour 30 minute recording of "Using Legacy with Specialized Studies - Legacy is for more than your family history"is now available to view in our webinar library for free for a limited time. Or watch it at your convenience with an annual or monthly webinar membership. Use webinar coupon code - tessa - for 10% off anything at www.FamilyTreeWebinars.com or www.LegacyFamilyTreeStore.com, valid through Monday, May 4, 2015. Join us on Tuesday, May 12, at 8:00 PM Central, when Jean Wilcox Hibben will present Need Direction? Try City Directories!. To attend this webinar, register at https://attendee.gotowebinar.com/register/6094939660972982529. April’s webinar, Using Evernote as Your Primary Tool for Capturing Notes and Ideas, presented by Drew Smith, is now available to ISGS members in the Members Section of the ISGS website (http://ilgensoc.org/members.php). For the complete list of upcoming webinars, visit http://ilgensoc.org/cpage.php?pt=234. Spread the Word: Forward this email onto your friends and colleagues, post the information to social media sites and/or your blog/website, or print out a few copies of our webinar flyer to hand out at your local society meetings. The flyer can be accessed at http://bit.ly/isgs2015webinarbrochure. Make a Contribution: Support the ISGS Webinar program by making a financial contribution, which will help ISGS expand its educational offerings in a virtual manner. To learn why we need your help, or to make a contribution, please visit http://ilgensoc.org/cpage.php?pt=345. Please direct any questions to the ISGS Education Committee at isgseducation@ilgensoc.org. The 2015 ISGS Webinar Series is Sponsored by FamilySearch (http://familysearch.org). Specialized studies take many forms – whether it is a one-name (surname) study, a one-place (location) study, or a cemetery, church or school survey. These projects often have us “reinventing the wheel” as we try to come up with a method for entering and using our data. Why reinvent the wheel when you can use Legacy? 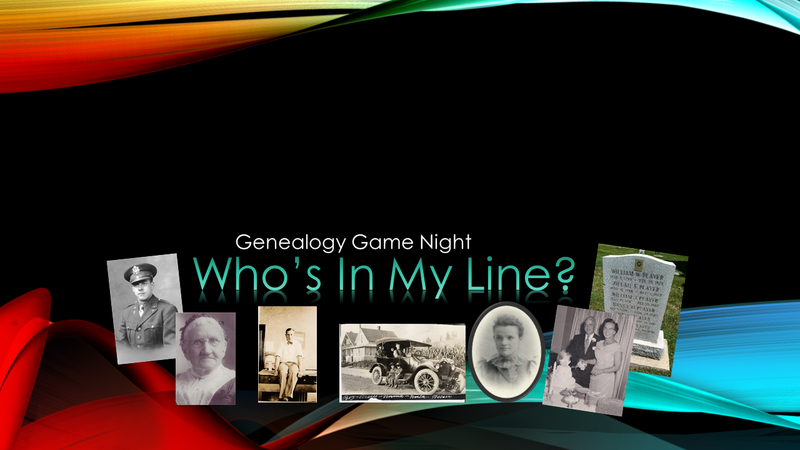 Join Tessa Keough as she shows you how she uses Legacy for more than her family history. We will discuss some tips and suggestions for using Legacy's well-known and lesser-known features with your specialized studies and projects. Whether you are simply thinking about a project, have just gotten started, or are taking a second look at your approach and software, there will be something for everyone. Join us for the live webinar Wednesday, April 29, 2015 at 2pm Eastern U.S. Register today to reserve your virtual seat. Registration is free but space is limited to the first 1,000 people to join that day. Before joining, please visit www.java.com to ensure you have the latest version of Java which our webinar software requires. When you join, if you receive a message that the webinar is full, you know we've reached the 1,000 limit, so we invite you to view the recording which should be published to the webinar archives within an hour or two of the event's conclusion. On the Upcoming Webinars tab, login to view the webinars you are already signed up for (available for annual or monthly webinar subscribers). Tessa Keough is a genealogist in transition (read – this is not her day job but she wishes it was!). She takes advantage of 21st century technology to work on her own family history as well as engage in specialized projects. These projects include a one-place study of her grandfather’s native community of Plate Cove East, Newfoundland, and a one-name study of her Keough surname. Seeing a need for an online users’ group for her favorite genealogy software, Tessa set up the Legacy Virtual Users’ Group Community on Google+. 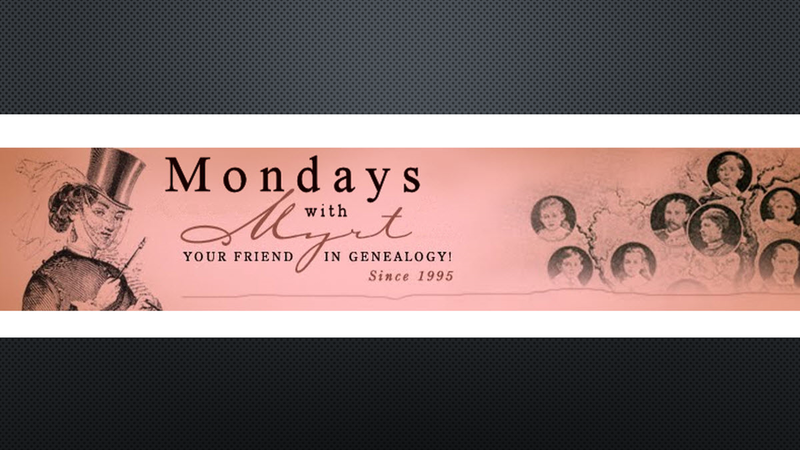 With three of her fellow genealogists, she co-hosts monthly hangouts-on-air presentations, provides tips, and moderates the member posts at the LVUG Community which boasts more than 900 members. For the past two years Tessa has served as the USA West Regional Representative for the Guild of One-Name Studies. In April 2014 she took on the post of USA National Representative for the Guild and serves as the Guild’s delegate member to the Federated Genealogical Society (FGS). She moderates the Guild’s Google+ Community and co-hosts the Guild’s North American monthly hangouts-on-air. Tessa blogs on her personal blogs, is a contributing blogger to Worldwide Genealogy, and is part of the 5-member interview team for the May I Introduce To You feature at Geneabloggers. 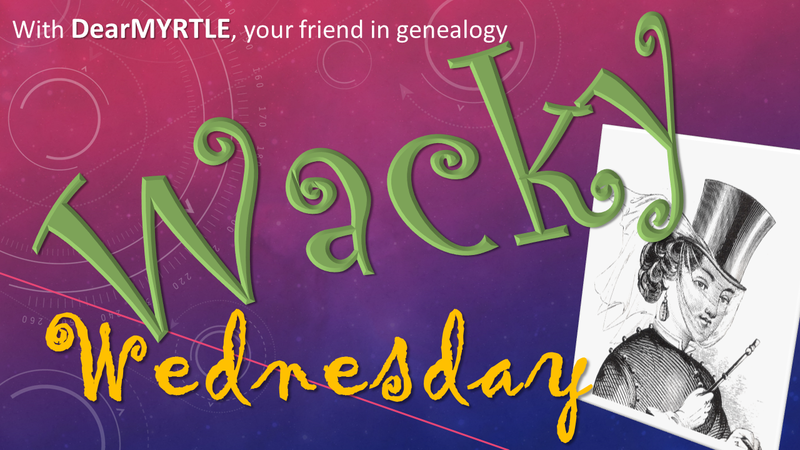 Tessa is doing her best to spread the word about surname and location studies as a fascinating and fun way to connect to your larger family history story, your extended relatives, and your fellow genealogists. In case you did not notice, Tessa is a huge fan of Google+ and YouTube and an even bigger fan of giving back to the genealogy and family history community. Her volunteer efforts landed her on Lisa Louise Cooke’s Social Media Mavericks: 40 to follow list in Family Tree Magazine’s March/April 2014 edition for TessaWatch (her YouTube channel with 120 short and not-so-short video tutorials). View Tessa's other webinars here. 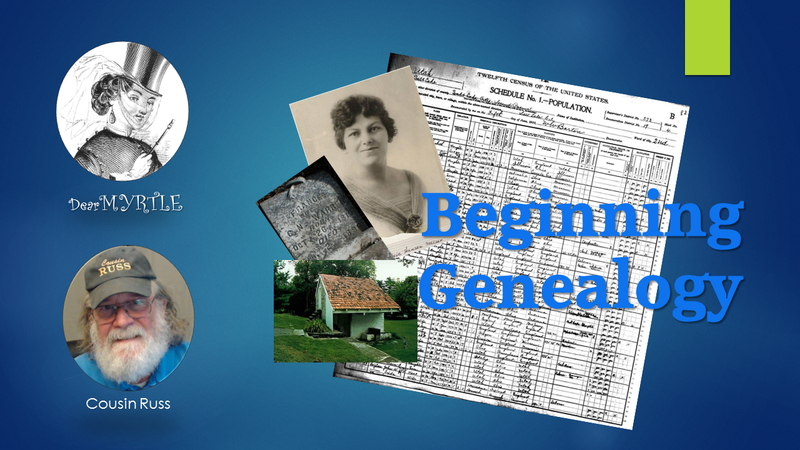 Savvy online genealogists look to the GeneaWebinars.com Calendar for up-to-the-minute info about virtual (online) classes. Most are free, first come -first served. Most are archived, though you may need to join the host site or society to access the archived sessions. 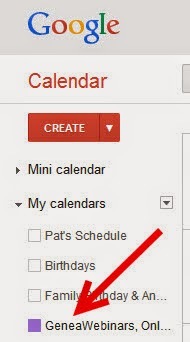 You can add the calendar to your list of Google Calendars by clicking the +Google Calendar button in the lower right hand corner of this calendar. Judy is the best. She makes law fun! What could have been a very dry and boring subject was laugh out loud funny.. thanks for hosting! Enjoyed the speaker. Makes me want to look for my ancestors' divorce records!!! Didn't know they may be very juicy. Excellent, excellent, excellent! "D-I-V-O-R-C-E!" was just full of very interesting avenues to explore and I loved the stories! Geoff's after webinar was (as usual) very helpful. Judy is so knowledgeable and entertaining--a combination that's hard to beat! If you could not make it to the live event or just want to watch it again, the 1 hour 44 minute recording of "D-I-V-O-R-C-E!" PLUS the after-webinar party is now available to view in our webinar library for free for a limited time. Or watch it at your convenience with an annual or monthly webinar membership. Use webinar coupon code - divorce - for 10% off anything at www.FamilyTreeWebinars.com or www.LegacyFamilyTreeStore.com, valid through Monday, April 27, 2015. Each week, +Cousin Russ and your friend in genealogy +DearMYRTLE host online genealogy video discussions in the form of Hangouts on Air (HOA). We have a variety of video panelists and a robust community of participants posting comments before, during and after each HOA. Now that we're back from the NERGC (New England Regional Genealogical Conference) we're raring to get back in the swing of things. How do DearMYRTLE Hangouts on Air Work? Includes detailed screen shots about what to expect, if you are new to Google+. Hangouts: Pay what you want Explains that while our HOAs are provided free using free Google technology, we do receive support from the genealogy community. Open panel discussion of what's trending in the world of genealogy. One of DearMYRTLE's very distant cousins hosts the open panel discussion zeroing in on a topic brought up during the previous Mondays with Myrt. Originally designed to provide opportunity for participants to join the panel, test out their headset mics, and use HOAs in an informal setting. We now find we're looking at characteristics of our ancestors' lives from a different perspective. These DearMYRTLE Hangouts on Air are provided freely to the genealogy community, though we do receive support through our "Pay what you want" policy. Join us this Wednesday AND Friday for two exciting genealogy webinars presented by Judy Russell and Bernice Alexander Bennett. On Wednesday Judy will present "D-I-V-O-R-C-E!" and on Friday Bernice will present as part of our Freedom Webinar Series, "United States Colored Troops Civil War Widows' Pension Applications: Tell the Story." Our ancestors' marriages lasted so much longer than our own. One reason: it was so hard to get a divorce. But it still happened, and the records created in the process tell us much about our ancestors, their lives and the laws they lived by. Explore the challenges faced by widows and/or former slave descendants of soldiers in the United States Colored Troops Widows’ Pension Applications. Webinar Reminder: Join us for the live webinars Wednesday, April 22, 2015 at 2:00pm Eastern U.S. and Friday, April 24, 2015, at 2:00pm Eastern U.S. Register today to reserve your virtual seat. Registration is free but space is limited to the first 1,000 people to join that day. Before joining, please visit www.java.com to ensure you have the latest version of Java which our webinar software requires. When you join, if you receive a message that the webinar is full, you know we've reached the 1,000 limit, so we invite you to view the recording which should be published to the webinar archives within an hour or two of the event's conclusion. Spreadsheets can help you analyze your genealogy data and keep track of your research. In this webinar, Mary Roddy teaches how to use this powerful tool to gain perspective and further your genealogy research. You’ll learn how to quickly take search results from Familysearch and Ancestry.com and create a spreadsheet for further analysis. You'll also get lots of ideas for using spreadsheets in genealogy such as city directory research, recording census birth places of families, keeping track of spelling variations for your online searching, and learn amazing spreadsheet tips and tricks along the way. Spreadsheets 201 is the brand new companion to Mary's Spreadsheets 101: Excel-lence in Genealogy. If you are an annual or monthly webinar subscriber, this webinar's recording is now available in the Webinar Library. Just head over to the library, login, and enjoy! 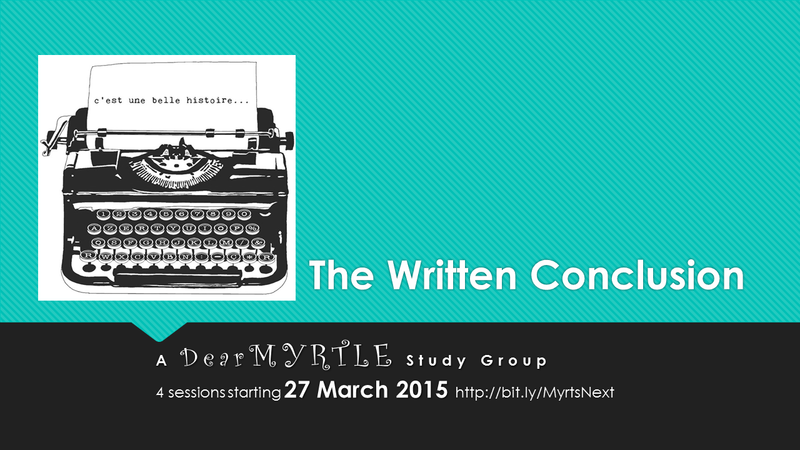 Fix pages of supplemental syllabus materials also accompany this webinar. Mary Roddy, a Certified Public Accountant, has been a genealogist for 13 years, becoming interested in the subject in anticipation of an extended trip to Ireland. She earned a certificate from the Genealogy and Family History program at the University of Washington in 2005. She is an active member of the Seattle Genealogical Society, having served in multiple board positions and on the seminar and education committees and is a regular facilitator on the SGS Brick Wall panel. She lectures frequently on various genealogical topics in the Seattle area. Her articles, “Mark Golden: A Case Study in World War II Research,” and “Sailing in Their Wake,” were published in Family Chronicle Magazine in 2012 and 2013, respectively. Her article, “Five Tips for Online Newspaper Research,” appeared in the June/July 2013 issue of Internet Genealogy. She presented her research on Mark Golden as part of the Southern California Genealogy Jamboree webinar series. She is currently working on a novel set in the San Francisco area in 1900 and 1901, based on stories of several of her ancestors and their associates which she discovered in her genealogical research. Click here for all of Mary's webinars. Another terrific webinar today, Warren Bittner was fabulous! My all time favorite webinar to date. I will refer back to this many times, I am sure!!! Another wonderful Webinar! Thanks so much for this great service. I'm in the second year of my membership and this is the best genealogy value! Please continue what you're doing. I've told all my friends about you and hope some of them join, or at least do some Webinars. Thanks again. Excellent idieas. I especially liked the idea of adding canvas space in Photoshop Elements. I will use that. Fabulous! Warren Bittner was one of the most knowledgable genealogists I've heard. I will certainly look for him at future conferences! If you could not make it to the live event or just want to watch it again, the 1 hour 44 minute recording of "Ten Genealogical Lessons I Learned the Hard Way" PLUS the after-webinar party is now available to view in our webinar library for free for a limited time. Or watch it at your convenience with an annual or monthly webinar membership. Use webinar coupon code - lesson - for 10% off anything at www.FamilyTreeWebinars.com or www.LegacyFamilyTreeStore.com, valid through Monday, April 20, 2015.